In my morning reflections and attempting to find a message for the upcoming year, I came up with a the saying above. 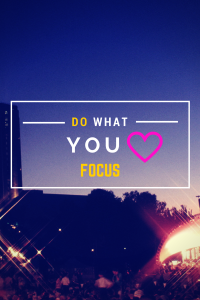 'Do what you love, focus.' The new year is always a time of reflection, change, and goal setting for the year ahead. There's something about the new year that makes us want to start over and not repeat the same mistakes from prior year. It's as if we have a fresh start on the life that we want to have, or a reason to believe that all of our hard work from the previous year will finally begin to pay off. I'm no different. Each year, I have goals for the year ahead written down, mapped out and placed on my vision board as a daily affirmation that those things will be achieved. Deep inside of us, our soul is often a driving force in the things that we desire to change in our lives. There's this inner voice, this tugging, or this feeling that we can't explain, yet it is as real as ever. Cheering us on and telling us to focus on what matters. It is in sync with our hearts willing us to continue on the path to our destiny. With that being said, what's my advice to everyone who is trying to make changes and achieve their goals? Focus. Don't become distracted with life's distractions. Keep choosing the right path and climbing the mountain—no matter how steep or how rocky the path—to your destiny. We all know that life happens; accidents, hardships, unexpected expenses. These things can all make it seem as if the plan that we have or the goals that we have set are not meant to be. Stumbling blocks will always be in the way, to distract you from your purpose and to get you off track, but you must continue to focus. Keep your eyes on the prize. Continue to travel the path that leads to your future. Even if it means leaving some things . . . and some people behind you. Focus, and do what you love. There is no greater feeling than accomplishing your goals and fulfilling the vision that God has given to you. I wish you all success and prosperity on the new year, as well as the courage and focus to not be distracted by the world around you. I pray that God can plug your ears from the haters and naysayers and give you tunnel vision to be obedient and allow Him to fulfill His promises. Stay the course, and above all else, do what you love.